RAID is currently competing in the 2019 FRC season with our robot Gobiesox. 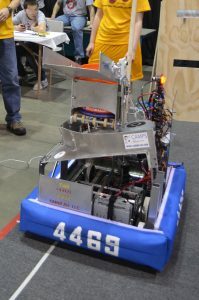 RAID qualified for the Pacific Northwest District Championship for the 5th consecutive season, and is currently on their way to Worlds in Houston. 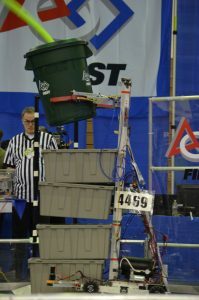 The game involves two alliances of three teams each, with each team controlling a robot and performing specific tasks on a field to score points. On planet Primis, each alliance works together to fill a cargo ship and a rocket, while still making it back to the habitat on time…. RAID competed in the 2018 FRC season with our robot Icarus. RAID qualified for the Pacific Northwest District Championship for the 4th consecutive season. RAID competed in the 2017 FRC season with our robot, Agitator. RAID qualified for PNW districts and World Championships. 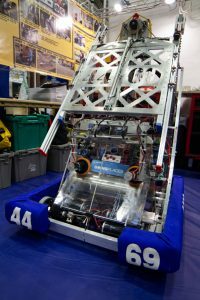 FIRST Steamworks was the FIRST Robotics Competition game for the 2017 season. 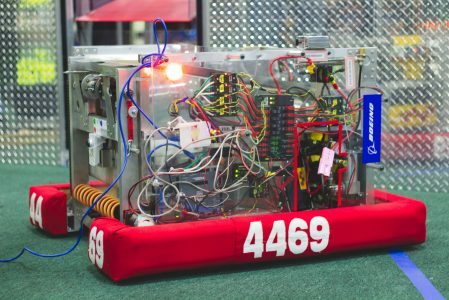 As in past games, two alliances of three individual teams and their robots compete on a field to score “match” point to win the game and ranking points to advance to playoff rounds…. RAID competed in the 2016 FRC season with our robot Lance. RAID won the Auburn High School event and also won PNW Districts and qualified for World Championships. 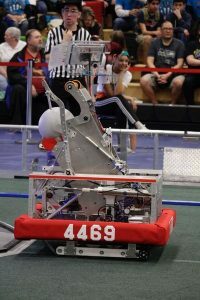 The 2016 FIRST Stronghold competition involved two alliances of three teams on each alliance with their robots performing certain tasks, trying to gain match points to win the match, and ranking points to advance to playoffs. The game had a medieval theme and the tasks included going over barriers and throwing a ball into a castle…. RAID competed in the 2015 FRC season with our robot. RAID qualified for the PNW district event and World Championships. RAID competed in the 2014 FRC game Aerial Assist in the Auburn and Auburn Mountainview events. The FIRST Aerial Assist 2014 competition involved two alliances, each with three teams. 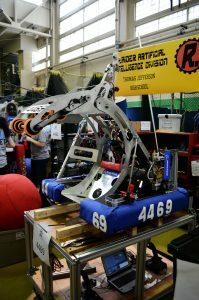 Teams would build a robot that would take a ball about 2 feet in diameter around the field and try to get it into a goal on the ground or shoot it into a goal above the driver station…. RAID competed in the 2013 FRC game Ultimate Ascent in the Seattle Regional Competition. The 2013 FIRST Ultimate Ascent game consisted of two alliances with three teams on each, trying to throw discs into 4 different goals, all at different heights….